For time: 10 reps, 200m, 9 reps, 200m, 8 reps, 200m, 7 reps, 200m, 6 reps, 200, 5 reps, 200m, 4 reps, 200m, 3 reps, 200m, 2 reps, 200m, 1 rep, 200m run, with reps of pull-ups, push-ups, squats, sit-ups, and burpees in each round. (1) Intent. Complete all rounds of the exercises as quickly as possible in a safe manner. This is an eight-person-team "task-specific" workout. The purpose of this workout is to develop cohesion and combat fitness under fatigue conditions through shared hardship, challenges, and competition. (2) Scheme of Maneuver. The platoon will be divided into as many teams of eight as possible. Each team will require two pull-up bars. 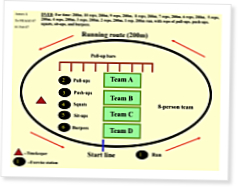 All teams will start at the same time. Each soldier will run 200 meters and then perform 10 pull-ups, 10 push-ups, 10 squats, 10 sit-ups, and 10 burpees. I just started CrossFit at my unit today. With a scaled DYER Frago! It was great!